Las Colinas is one of the more upscale and modern cities you’ll find in the DFW Metroplex. Also known as the Booming Business Community. With large golfing lands, sculptures, and a taste of Venice, you’re surely going to enjoy being in this city. We began working on this blog series to help connect couples with their dream venues. Our list of Top 5 Las Colinas Indian Wedding Venues benefits each couple that wants an amazing wedding weekend. When coming up with this list we thought about events that are part of many Indian Weddings (Hindu, Muslim, Christian and Sikh). Pre-wedding celebrations such as the Garba, Sangeet, and Mehndi nights can be held in the smaller ballrooms, there is a clear path for baraats, and the larger ballrooms are spacious enough for the traditional big fat Indian wedding. Welcome to the ideal place to host your wedding weekend. This Las Colinas Indian Wedding Venues has grand ballrooms, lovely gardens, and Lake Carolyn you will feel the vibe of what your idealistic wedding can be. Here are the highlights from Elizabeth and Sunil's weekend Recetption at the Omni Mandalay Las Colinas. We love mixed couples and involving all of their guests in the celebrations which is what the bride and groom love about us. It is important to not only balance out both cultures but also do everything you and your guests will enjoy. The magnificent ballrooms of the Dallas Marriott Las Colinas have a special charm and thats how it made it to the list of Las Colinas Indian Wedding Venues. It gives off a great vibe and with designs you love you can create an ultimate wedding space. Most couples use the main ballroom for the sangeet, wedding and reception. Tejas and Megha had a great idea for their baraat and photo shoot. Picture the groom arriving on a gondola for this baraat. Definitely a unique entrance and a great backdrop for after wedding photos. This young Gujarati couple value energetic music and amazing lighting. Check out the video so you can see the ballroom nd how much fun everyone had. With many ballrooms here at the Four Seasons you will find the perfect space for your wedding. The purity of the rooms will give you the ability to add in your own chic styles for an antique or modern feel in the reason it made it to our list of Las Colinas Indian Wedding Venues. We have done many events there but wanted to share a wedding with you that we weren't a part of. Natasha & Sandeep utilized the space very well. Sang night at the Pavilion, outdoor Baraat and Wedding and the reception in the Four Season Ballroom. The DFW Marriott has a private access that leads to the foyer of the ballroom. Another plus is that the ballroom is away from the rooms which means you can enjoy your music louder and till later. Freddy and Purvi chose this venue for their wedding weekend. When the bride and groom want to party, we make sure everyone is having a good time all weekend long. The Wedding and Reception lighting is perfect with the right amount of uplights, great gobos and moving spot lights helped highlight it all. The first dance on a cloud is what couples need to make their wedding unique. Here's a clip of how much fun the dance floor can be with us entertaining! This is the perfect place to stay and have your wedding when your family and friends are flying into the metroplex for your wedding weekend. From the moment you walk in, to the final goodbye you will be stress free and enjoy each moment of your special weekend. We loved being a part of Elisa & Kenneth's wedding because they wanted the lighting to be perfect and everyone on the dance floor. Couples wonder why we are perfect for mixed/fusion couples. Along with hundreds of Indian Weddings every year, we also perform at quite a few Country, Black, Hispanic and Asian Weddings. Since we do many different culture weddings we are the best choice when wanting to keep everyone happy and on the dance floor. Your wedding is the happiest moment in your life therefore choose a venue you love and the right vendors that will help make your special moment a time you’ll never forget. 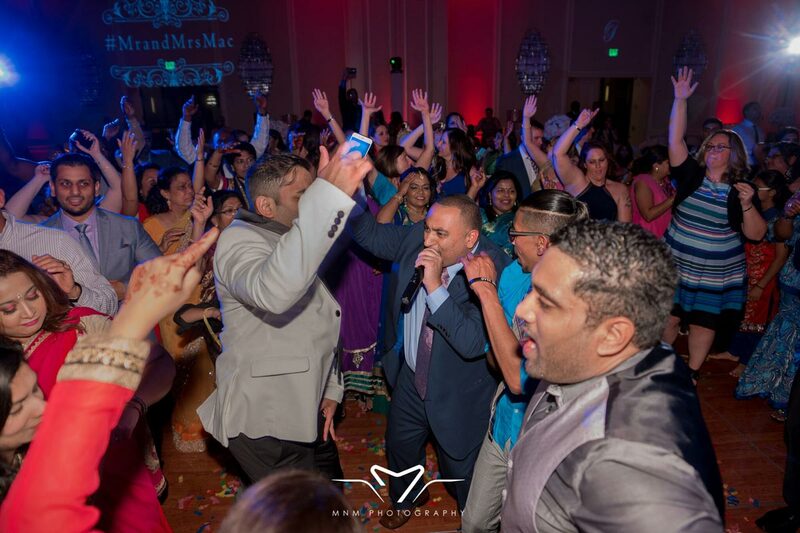 Over our 23 years of bringing joy to thousands of couples, the DJ Riz Entertainment team performed many times at all of these Las Colinas Indian Wedding Venues and can ensure you will have the time of your lives. Given these points, if you would like to talk about which venue we think is best for you or want more information on our services, contact us here.